Come on down, and bring the hand sanitizer. Occupy Cleveland, the homespun spin-off of Occupy Wall Street that began here on October 6, will wrap up its second full week by pulling up stakes and squatting elsewhere. Its ramshackle row of tents has outgrown the sidewalk across from the northwest quadrant of Public Square, so Friday it will begin a move into the quadrant itself. Whether that move goes off smoothly remains to be seen. The plans call for a rally at 1 p.m. to coincide with the pilgrimage across the street. The group promises food, music, and speakers — and invites anyone who wants to help or support the occupiers, or just to learn more, to come on down and enjoy the refreshing October rain along with them. 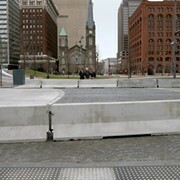 Occupy Cleveland’s permit expires Friday at midnight, and it does not have authorization for the move. The group will also host its weekly open-to-all general assembly from 6-8 p.m. Friday at Old stone Church on the north side of Public Square. 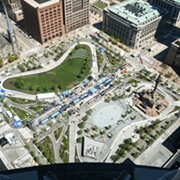 On Monday, Occupy Cleveland started its brown-bag lunch education events. 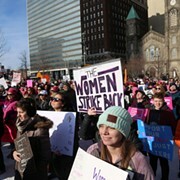 From noon-1 p.m. each day, it will set up in the southwest quadrant of Public Square (across from Tower City), with megaphone time given to anyone with a message. On Tuesday, that included a pitch for more green jobs and an announcement of the launch of Occupy the Hood Cleveland to focus on the disproportionate impact the bad economy has had on minorities. One occupier sat off to the side and strummed on her bright blue acoustic guitar, while a graybeard from Cleveland Heights’ Revolution Books buttonholed people to make a pitch that Communism is the answer to America’s woes.